Colbert fills in for De La Soul and kills his verse. A week after Gorillaz performed "Let Me Out" with Pusha T on Stephen Colbert's Late Show, the show posted additional footage of the band's time in New York on Friday. 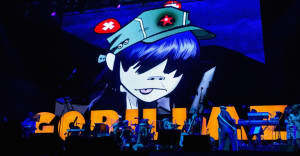 It included a clip of frontman Damon Albarn and Colbert performing the band's hit song "Feel Good, Inc." In the performance Colbert took over De La Soul's part of the song and rapped from another room in a fuzzy hood. Watch the performance above. The show also posted an additional 30 minutes of behind-the-scenes footage of the band which you can watch below.